Intelligent collaboration solutions in the cloud to unleash your teams full potential. Our award-winning platform integrates content, project and knowledge management with best of class social business tools. About The Water Network: The largest online knowledge sharing platform and business exchange for global water professionals. Members represent over 7000 companies from 180 countries. Powered by TallyFox. Trudi has 30 years of technology management and venture capital experience. She is the Founder and CEO of TallyFox Social Technologies AG, Founder of Yew Ventures AG. A long time Advisor to Fleming Family & Partners Private Equity (London). Her Board experience includes: Radio Free America, LLC (USA), RFI (Panama), Goodway Technologies (Sweden); Anam Mobile Ltd. (Dublin Ireland); UBLOX AG (SWX UBXN); Radioscape Ltd. (UK); and ASK SA (France). From 1999 to September 2005 Trudi was General Partner of iGlobe Partners a global technology venture capital fund as the European GP and mobile technology specialist. She was also the secondary Director of MTONE Inc. (China), and Telenav Inc. (USA). From 1993 to March 2000 she served as an advisor to the Governor of the State of California on cross-border expansion and venture capital in her capacity as Managing Director of the State of California�s European Offices of Technology. The offices (London, Frankfurt, Munich) facilitated cross-border partnerships and investments into California technology companies. During her leadership under both Governor Pete Wilson and Grey Davis, these offices facilitated deals valued at over $500 million. From 1979 to 1993 Trudi worked for General Electric in several executive roles. Her Industry focus included power generation, oil and gas, and manufacturing automation technologies. 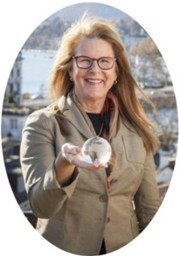 Trudi earned her Bachelor�s Degree in Engineering Sciences from Lehigh University, USA in 1979 and an MBA from the Institute for Management Development (IMD) International in Switzerland in 1990 where she co-founded The Venture Capital Club. Trudi is a graduate of the 1998 EVCA Venture Capital Advanced program. She was awarded a Biochemistry Research Fellowship in 1978 from the Medical College of Pennsylvania and completed the Middlebury College Intensive French Language program in 1974. Trudi is: the founder of �Cal-IT Europe� the leading US-European Information Technology Partnering & Investment Forum; Vice President of the European Tech Tour Association; President of the German Tech Tour 2000; founder of the California Association of Germany; and serves on the Board of Trustees of People in Need- Gerhard Baumgard Foundation for humanitarian assistance of young and old people in South East Asia. Hobbies: Golf, marathons, tennis, skiing, flute, painting and scuba diving. CEOCFO: Ms. Schifter, would you tell us the concept for TallyFox? Ms. Schifter: The concept behind TallyFox is to provide an open-core solution for knowledge sharing that is fun & easy to use. Our collaboration solution can be used for small teams and can expand to address entire companies. Why is that an issue? When you talk to anyone who is trying to figure out how to collaborate and be more innovative, it is changing people�s behavior, and changing the way people work is a process. Everyone we talk to knows where they want to go but when you start the process, it is not clear how to get there. When you look at a very rigid solution or single app where you might think your priority is right now that is almost never enough for where you end up. The goal may be clear, i.e. sales force innovation or to provide a way to ideate, or serve clients better, or whatever the end game is. People do not know what that looks like, how it starts, and that evolves. To create a bespoke solution is hard or even impossible because you do not know what to spec. It is one of those things that people need to actually start doing very quickly to get experience to know what works and what does not work and more importantly where to start and then to have a solution to grow with their needs. CEOCFO: How is TallyFox used? Ms. Schifter: It is what we call a no-touch interface, which means you go to the site and open it up and say yes I would like to start this. The system should be smart enough to let you start without having to read a tutorial or anything like that. The idea is to start to collaborate and share knowledge and content out of the box. CEOCFO: Does a whole organization need to be on TallyFox so that people could collaborate? What are the mechanics? Ms. Schifter: No, many organizations have specific projects, or use cases. Competitive Intelligence is a perfect example that typically involves a cross functional team, that can generate immediate results, and does not need to engage the entire organization. Most companies prefer to have a space that they define who can see it in terms of privacy settings. If you want to have closed space for people that you identify, then they would have to be members. Either they are imported or they would join the space. It is not restricted to people who are within the same organization. Almost all of our use cases are for organizations and teams that have a need to collaborate both internally and externally and that may be with their stakeholders, suppliers, customers or research or project partners. CEOCFO: What were the challenges in creating a system that someone can utilize intuitively? Ms. Schifter: It has been a long process altogether because our vision is to create an open core knowledge sharing platform for the world�s most critical sectors. In the process of doing that, we have learned a great deal about where people get stuck because we power, for example, the largest community for global water professionals with our platform and there are many work spaces inside. It is something that we understand better each year, and with each use case ourselves. The market and the technology have moved a lot in five years. We are in the process of launching our next generation platform, that takes all of our learning to take zero touch to a new level. This is based on hundreds of clients� feedback and tens of thousands of people using the platform over the last five years. CEOCFO: Is the world, in general, aware of TallyFox? Ms. Schifter: We have been focusing on large clients and our network platform for the last few years. I mentioned The Water Network (www.thewaternetwork.com) so if you look in the water sector many people have heard of us. We have a strong brand recognition there. If you look in the broader communication collaboration solutions space I would say no, it is a very crowded space and there are many companies playing here. We are just moving into a stage of the company where we will be doing broader promotion. To reach a stage where the product is �zero touch� out of the box, fun and easy for people to start even if they only have ten members in their team has taken time. The world will hear a lot about us in 2015 I hope! CEOCFO: Why is this the time for the push? Ms. Schifter: I think that it is both market readiness and the fact that we have now evolved to our second generation platform to be ready to address a mass market. From the market readiness perspective, if you dial back five or six years ago, at that point in time many people were thinking that a social network for their company was the solution to better collaboration. Those were the days when we were saying it is all about social business. It is true that the evolution to change the way people work and to share more collaboratively online is social but it is well beyond just that. I think that was a learning process in the market. There has been the tendency of larger companies to develop their own solution with the thinking that there are enough off-the-shelf tools to do that easily. They discovered this is a complex topic and the more that you go down that road, the more you realize that the list of functionalities is well beyond social networking, that the path of a custom software development solution is rocky, not your core business and never ending. Clearly no one wants to recreate another proprietary legacy system. This process has taken time. Our philosophy is to provide an app- based modular solution in open core architecture that works out of the box and still can be customized for specific needs. CEOCFO: Do you, personally, use TallyFox? Ms. Schifter: Yes, I use it every day as a customer because I am the CEO of AquaSPE, which runs on the TallyFox platform to manage The Water Network. Our whole team uses the platform. I think it is impossible to build a great user experience if you do not use the product yourself. CEOCFO: Would you tell us about your other ventures? Ms. Schifter: The Water Network is the first knowledge sharing network based on the TallyFox platform. We chose water because it is an overriding global crisis and fundamental to everything. It is fundamental to health and education in the developing world. It is central to a humanitarian crisis and key to economic development. There is not enough fresh water to develop enough energy, agriculture or manufacturing to meet demand. For pretty much all of the world�s primary sectors, from health to energy, water is one of the critical growth factors and it is complicated. Most of the people in the water sector who are knowledge workers have advanced degrees because you do not get an undergrad degree in water management. These are usually engineers, computer science grads or chemists who go on to get their Master�s or PhD in a specialty area within water. There is also a need for cross functional sharing. Bringing together collective intelligence in water is a fundamental need. Imagine what we could do if such a network existed for water, agriculture, energy, health care, textiles� this is our passion, to see this happen. CEOCFO: What is the strategy for rolling out TallyFox? Ms. Schifter: The first step is from the top down in other words, focusing on new networks. We are focused on those with a need for turning on the connections and potential of their community internally, and connecting to the rest of the world. That is pretty much everyone who has an organization with a need for intelligence sharing and all professional associations. The trend today is to take existing websites or your existing community and turn it into instead of a one-to-many, a one-to-one collaborative community to get the value out of your connections. It does not have to be a whole food sector; it could be an association or a professional group of people or a project team. We are focusing on those who need a capability to share knowledge within their community, which is from a few thousand to hundreds of thousands of people. The bespoke option for those people who need what we provide is very expensive. There does not exist an off-the-shelf solution to do what we do, so the value that TallyFox provides is very high. To reach SMEs and smaller teams we rely on viral marketing, our website, and the members of Networks powered by our platform. CEOCFO: Why pay attention to TallyFox? Ms. Schifter: We are the absolute leaders in providing an out-of-the-box way to connect and share knowledge. Everyone today needs to innovate to stay alive, whether to service clients better, answer their questions faster or to have research that is more focused or just to collaborate amongst your own team to work more efficiently. To maintain Competitive intelligence is a real time need of every knowledge worker. Our platform is perfect for sharing and discovering contextual market intelligence. The question is how you provide that so that you can get started out-of-the-box. We are the only company that does that. The way I normally present the vision of the company is that we are focusing on delivering the initial benefit that the WWW was designed to enable, i.e. sharing our collective intelligence to design a better future together. When you look at the mass market solutions that are connecting people, they tend to be more like Facebook and LinkedIn, or very proprietary and expensive. The challenge is how to communicate that what we provide is highly differentiated from all the social networking solutions out there. It is collaboration but the way we do it and the way you can grow without a bespoke project is what is different. It is easy to focus on the technology, and a single tool, or tools. Where it gets difficult is building a thriving knowledge sharing culture and community. You are changing people�s behavior and that is the most difficult thing. From my perspective, that is where everybody is stuck. The person who is supposed to manage these projects or communities does not have the skills or the training. We have tried to focus on these people, to make their job easier. No matter who you are, if you are trying to actually turn on the value of your community, there are many tools out there, we help community managers focus on the community part, not the tech part. It is easy to focus on the technology and spend a lot of time on that. We enable our clients to start the community development right away, and try and make their job fun and as low touch as possible.